Whether you run a large or medium hotel, one aspect you cannot miss out is the reservation system. Many people mainly tourists would want to book their vacation rentals and accommodation at your place in advance. If they are in geographically different nations from your place, then the best way for them to do is via an online hotel booking software which you could provide them with. So what do you do to give them this extra convenience? The answer is quite simple. Today you can easily get a booking script to include in your hotel’s website and thereby provide an online hotel booking facility to your potential guests. Such a convenience would be greatly appreciated by guests as they can now avail themselves of your accommodation and associated vacation rentals via the internet through this online hotel booking software. 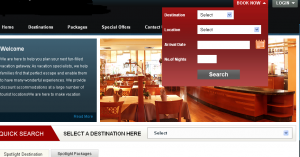 There are tons of such applications available today and you need to choose a script that best suits your hotel needs. It is wise to invest on a vacation rental script that is open source as you would thereby be entitled to have it modified by a technical consultant to integrate your businesses look and feel onto it. With regards to the potential of such a script, well you might probably know what all things an online hotel booking software can accomplish for you. Firstly your reservation system would be efficiently streamlined and you can have a grip of things in your hotel. No visitor would be greeted by a no room message once they arrive after booking if your online reservation software has tight integration to your hotel’s database that comprises of room information, package and other assortment availability, etc. Thus even physical door reservations too can be handled via a separate interface that works hand in hand with the vacation rental script. The software would help you update information such as your hotel’s contact address, telephone number, location on Maps, etc so that potential tourists or holidaying parties can easily identify your hotel. With regards to the hospitality segment, an online hotel booking software can also be used as a reservation portal for associated services like ordering of cuisines, cruises, transportation, etc which are all probable services visitors would appreciate you providing them when they reach your destination. In addition to these, hotel facilities like Gym, Spa treatment, meditation and massage sessions, skin and other medical personal appointments can also be made available as services for advance booking via the online vacation booking software. An important factor you need to look into while choosing a vacation rental script is the security of the payment channels they provide. Since people would pay you for the advance booking, it is your responsibility to ensure that sensitive financial information does not fall into the wrong hands and hence you should pick and online booking script that securely integrates payment gateways to your system. So with an efficient online hotel booking software, your reservation system can be fully controlled and streamlined to ensure that your guests receive the warmest welcome and the best and fastest service delivery to lure them into coming back again. How to find the right social media monitoring tool?